I can remember that, when I started out as a graduate student in the late 1980’s, we were just coming to the end of the era where there was a lack of communication between the science of the West and that of the Soviet and Eastern European countries. This schism was especially widely felt in dynamical systems. Techniques like the Melnikov method, Shilnikov coordinates and the whole qualitative theory of dynamical systems from the Andronov school were being rediscovered in the West. There was also a strong tradition in mechanics, especially nonsmooth mechanics of impacts and friction especially in Poland, the former Czechoslovakia, Hungary etc. The Eastern European approach combined mathematical rigor with flair in geometry, the qualitative theory of dynamical systems and their associated approximation methods, whereas the Western literature seemed, at least to me, to have been overly mired in either functional analysis and so-called rational mechanics, or in formal asymptotic expansions. Of course, all that has changed in the intervening three decades. Through the Internet, all science is available at the click of a button (although sometimes behind expensive paywalls). Conferences take place all over the world on topics that include many cross-fertilizations between traditions and specializations. International scientific barriers really don’t exist. And yet, it seems to me that there is still a temptation to revert to national or regional stereotypes and ways of thinking. We can all accidentally be guilty of citing our friends and colleagues from whom we first learned a technique or concept rather than the true originator of the idea. 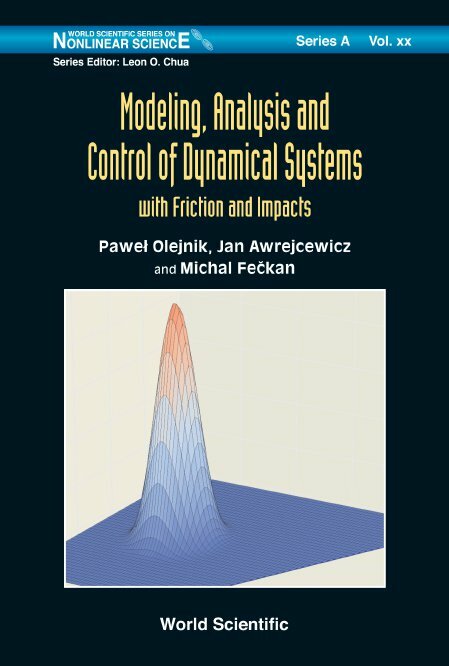 This monograph weaves an interesting path through theory and application of methods from dynamical systems theory to systems with friction and impact. The perspective is very much from that of the Polish and Slovakian tradition and the large contribution to these topics made by the authors, their collaborators and their forbears. It thus provides a much needed alternative perspective to other books, papers and review articles on related topics. It is important in my view that these alternative perspectives are added to the literature, because, the definitive theory of nonlinear systems with so-called harsh nonlinearities (either multi-scale or nonsmooth) has yet to emerge. This book provides an interesting addition to the attempts to unify this topic, specifically from the point of view of low degree-of-freedom rigid-body systems. There is also a nice juxtaposition between practical experimental implementation and mathematical rigor. The emphasis is on understanding the origin of chaotic dynamics, and other irregular behavior, and how this can be identified, analyzed and ultimately controlled. The book moves from experiments, modeling, system identification, analysis of ensuring motion, to control of systems with discontinuities. This latter topic seems to me to be the most novel. There are also numerous references to the literature, and an attempt is made to maintain a historical narrative. The main strength of the book is that, after the first general chapter on friction modeling, each chapter reads like a self-contained study. I would imagine that many of the chapters could form the basis of an advanced student project or topic for independent study. That being said, this is a monograph, and not primarily a text book. However, this strength is also a potential weakness. It is episodic rather than comprehensive; there is no attempt to present a general theory. It ends abruptly, without any attempt to summarize or look to the future. Some of the chapters appear a bit thin and only loosely connected to the general thrust of the book. While Chapter 1 contains many references to the literature on different friction models, some of the later chapters miss the opportunity to survey what can be a large literature. A striking example is the thin Chapter 5 on Bifurcations in Planar Discontinuous Systems which makes no attempt to be general or to mention the huge literature on this topic. Also, despite the ample bibliography, the literature that is surveyed is rather patchy. Perhaps, given the range of topics presented and the popularity of their study across mathematics, engineering and applied science, an exhaustive reference list would be impossible. Nevertheless, I found the choices to be idiosyncratic. For example, on friction laws, there is nothing on the so-called rate-and-state formalism , from which many other friction laws can be derived. I also think the ground-breaking discontinuity-mapping ideas due to Nordmark deserve mention [2,3]. But maybe I am being guilty of my own bias. There is certainly work here with which I was not familiar, and references I was unaware of. And that, I guess, is the point. In summary then, this monograph presents an enticing alternative view of a field that is very much in progress. It is not the definitive textbook, but would be a welcome addition to the bookshelf of researchers and advanced students trying to make sense of mechanical systems with discontinuities in the form of friction or impact. Cabboi, A., Putelat, T., and Woodhouse, J., The frequency response of dynamic friction: Enhanced rate-and-state models. J. Mech. Phys. Solids, 92 , 210-236 (2016). Nordmark, A.B., Existence of periodic orbits in grazing bifurcations of impacting mechanical oscillators Nonlinearity 14:6.1517-1542 (2001). Dankowicz, H, and Nordmark, A.B., On the origin and bifurcations of stick-slip oscillations, Physica D 136:3-4,280-302 (2000).